My theological meanderings have brought me to Judaism. If I am to understand the foundation of my faith, I must understand where it came from. And Christianity is definitely born out of it's Jewish roots. The biblical condemnation of the Pharisees and centuries of anti-Semitism, I fear, have kept Christians from any deep look at our similarities. That's where we get peace from, isn't it, not from highlighting our differences, but how we are fundamentally the same? I've been transported by new ideas in the way that a Jewish scholar may approach the Bible. And don't think that all scholars approach the bible the same way. A treasure from the Jewish school, I think, is that reflection, questioning, and doubt are part of the curriculum. So, anyways, I've been introduced to the concept of the seven fruits of the soul. In Chaddism, wheat, barley, grapes, figs, pomegranates, olives and dates have allegorical meanings beyond the plain reading of the text. Each represents a quality of man, specifically transcendence, vitality, joy, awareness, action, struggle and tranquility. 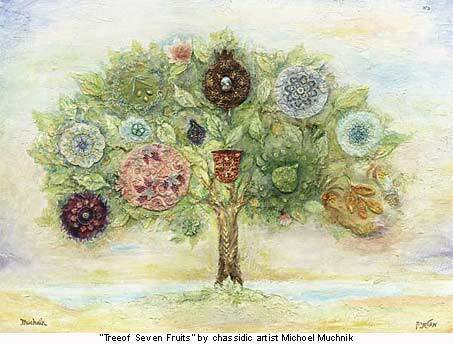 The Jewish holiday of Yom Habikkurim celebrates rebirth in the spring and the first fruits of the harvest, including these seven traditional "fruits" of Isreal. For Christians, we would recognize this in the Old Testament as the feast of "first fruits". What relevance does that have for us today? Well, in reflecting on our seven characteristics or needs, we might see where we are out of balance, or where one over-arching characteristic or need has overtaken our life. It might help, on self, reflection, to re-introduce balance in our lives.